So first off, if you haven’t seen it, the first episode of The African Americans: Many Rivers to Cross, “The Black Atlantic,” is available to watch UNTIL 10/22/2017 (okay so you have a minute but don’t delay…. LOL) I appear in the episode discussing early African American foodways and I prepare a meal for Dr. Gates based on early African American foodways as recorded in 18th and 19th century journals, cookbooks, narratives by enslaved people and emancipatory narratives and oral history. So there was a TON of feedback from the program but the biggest question behind the scenes was: What exactly did you make Dr. Gates and why? And…what did we miss on the cutting room floor? I made Dr. Gates a feast of foods based on my original research. Most of the produce was from my garden or the gardens at Historic Londontown and Gardens, with whom I have worked with before, which graciously hosted us for the interview and cooking. Dr. Gates got to enjoy some authentic produce like the juicy red Plate Du Haiti tomato brought to the United States in the period of the Haitian Revolution. He also enjoyed delicate White Pattypan or cymling squash, fiery Fish peppers, Caribbean Red peppers, the earthy and savory White Yam, Hayman and Spanish Red sweet potatoes. The Hoppin’ John was made with a type of cowpea I grow in my garden from Senegal that looks a lot like our Blue Goose or Speckled Goose Crowder Peas. I also showed him the Carolina Black and Carwile’s Virginia peanuts. The greens were shiny and verdant Green Glaze collards plucked from garden. There were Yam white potatoes and noticeably absent was Cowhorn and Star of David okra–which was growing plentifully in the gardens–not one of Dr. Gates favorite dishes. The table had collards and turnip greens cooked with salt pork, stewed black eyed peas, Hoppin’ John and red rice from the Lowcountry via Senegambia; kush a spicy cornbread dish with roots in the Western Sudan region of West Africa, peanuts–called nguba and mpinda in Kongo-Angola. There was fried chicken and barbecue too showing the most notable contributions to Southern protein cookery. There were oysters and fish on the table, and a plate of black eyed pea and rice fritters from the Lower Mississippi Valley. I made sweet potatoes the way they were done on sugar plantations–boiled in cane syrup until soft. The table had wild foods like locust pods and persimmons, and a bit of hominy, salt pork and preserved rabbit…showing the full spectrum of our Ancestors diet across multiple regions, time and space. 1. Enslaved Africans are not culturally monolithic..in fact ethnic origins and shifting ideas of ethnicity and community are very important. The first enslaved Africans to arrive in South Carolina in 1526 and those in Virginia in 1619 were not likely from the heart of Africa–they were cultural boundary crossers whose people had contact and conflict with Europeans for centuries. Many of them had adopted and revolutionized Christianity and spoke a pidgin and the rudiments of a European language in addition to their native tongue and any lingua francas. Being in the Old World at this time–anywhere–means war, trade, enslavement, intermarriage, food and religion—are major factors for the mixing of genes, cultures and understandings of who you are and where you are “located.” Africans, Native Americans, Europeans and others become a mixture of people from whom words, recipes, and dishes were created and became a proto-Southern, early African American cuisine. Foods from other parts of the African Atlantic/Black Atlantic and African Diaspora criss crossed the Old South. 2. Cooks are male and female. Male chefs–were a real reversal of cultural roles for the earliest African Americans–women did the majority of cooking in West Africa with the exception of roasting large pieces of meat (yes barbecue) and some ceremonial cooking. In the colonial period, male chefs were preferred for higher end cooking. Thus people like me would not have been uncommon in the 18th and early 19th centuries. Over time female cooks came to be predominate on Southern plantations. 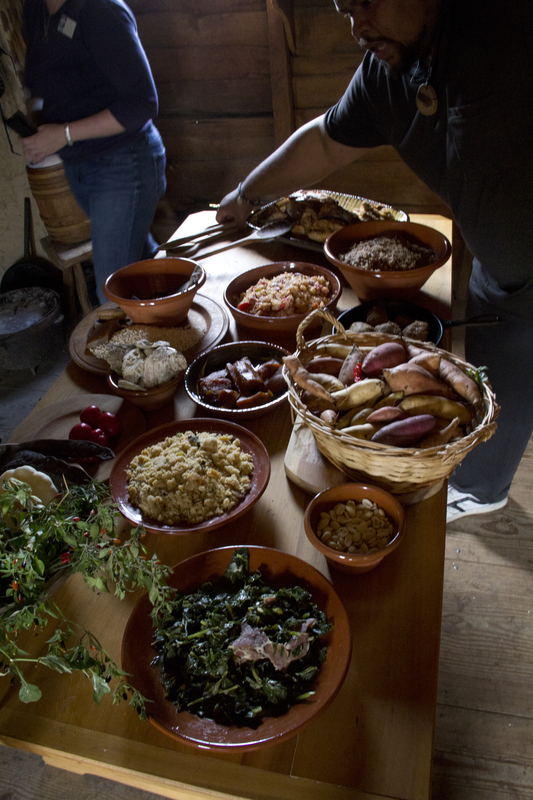 Professional chefs like Hercules of Mount Vernon and James Hemmings of Thomas Jefferson’s stay in Paris and at Monticello–among others–were responsible for mixing European, African American, American and other ways of cooking and knowing food together. 3. African people were not just enslaved, and they were not only in the South!!! New York, Philadelphia, Boston, Newport, southern New Jersey and other large population centers had cooks and farmers and gardeners and CATERERS that were Black and sometimes, free born or emancipated. The North drew in influences from the West Indies as well as West and Central Africa. 4. Black women were marketing food in all of the early urban centers where an enslaved population was to be found. They sold produce alongside their children and husbands that sometimes translated into currency used to buy freedom or secure means that might help them obtain their freedom. Many of the early receipt or cookbooks reflect centuries of culinary knowledge passed down by Black mothers, much of it passing into the hands of women like Mary Randolph, Lettice Bryan, Sarah Rutledge, B.C. Howard and others who are credited with writing the first Southern cookbooks. New England, the Middle Atlantic, the Chesapeake and Tidewater, the Lowcountry, the Southern Frontier and Backcountry, and the Lower Mississippi Valley, Gulf Coast and Florida all had varrying degrees of African influence in the cooking established there that would eventually spread west as the United States became established and expanded. 5. The Black diet was very basic—but so was the diet of the everyday European and Native American. The planter and merchant aristocracy was unique in their access to fine foods and the unique creolization of foodways. However, fine and Western foods came to the quarter even as Africanized foods are going to the Big House. There is an exchange-and with that exchange came power. The diet was based on pulses, grains, and preserved animal proteins. Think hominy, cornmeal, rice, sweet potatoes and like foods enhanced by fish and game and garden produce. This would be further enhanced at holiday times or accidents of fortune where ingredients otherwise rarely enjoyed would be savored. Food had clear associations with religion and spiritual beliefs, cultural hidden messages, the underground economy and the early African American sense of self. I just watched the first episode of the series and wanted to say that I loved your segment. African influences in US culture has long been of interest to me. Plus, I’ve got to tell you that your segment made me hungry – very hungry. This is the food from my childhood and unfortunately this cuisine is not readily available where I live (I’m working on learning to cook it myself). 😉 Your blog is very interesting; your work is inspiring. Thanks for everything you do to teach about food history and food justice! interesting insight onto afro-am cuisine. the first section mentions a lot of vegetables to plant to make any garden more exciting and culturally rich. So much love on that table. Thank you for sharing it.